A woman who put to bed two weeks ago has been beaten to death by her husband over a misunderstanding. 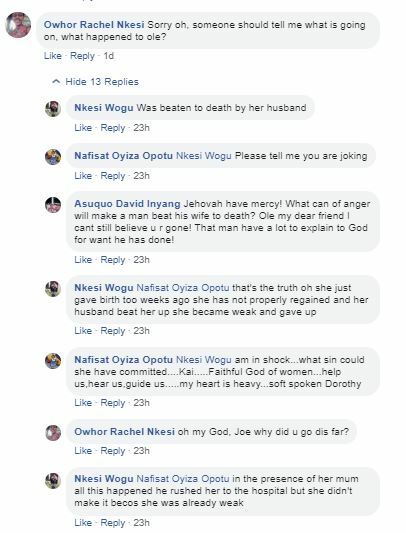 According to Nkesi Wogu, the victim Dorothy Ole Ogoloma became weak due to the beating she received from her husband before giving up the ghost. "My niece with a two-week-old baby was beaten to death by her husband. The man is on the run; he's from Etche and also a witness. Goodbye, my soft-spoken sis rests in peace." 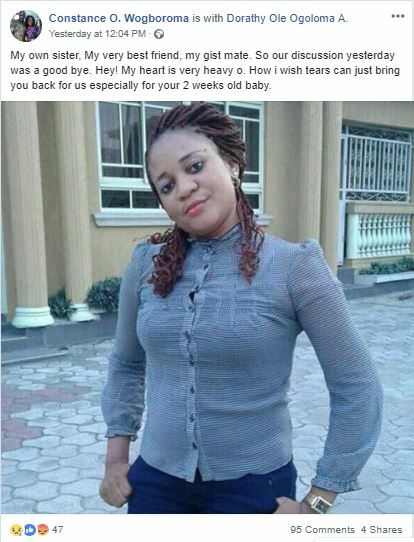 her sister Wogu wrote on Facebook. "My own sister, my very best friend, my gist mate. So our discussion yesterday was a goodbye. Hey! my heart is very heavy o. How I wish tears can just bring you back for us especially for your 2 weeks old baby. That's the truth oh she just gave birth two weeks ago she has not properly regained and her husband beat her up she became weak and gave up, in the presence of her mum all this happened he rushed her to the hospital but she didn't make it because she was already weak."